Historically, the first truly human apparition on a world other than his own dates back to 1969. Certainly, there was no colonization as such, since it was not a question of the formidable technical challenge and prestige that It connected with it, only with a mission of "exploration", and remained on the spot only scientific devices. The star of the night, companion of the earth and "daughter" of it if one considers the most credible hypotheses as to its formation, attracted men since the dawn of time. The first astronomers saw in its dark surfaces seas and the imagination, through literature, made another inhabited world, necessarily strange, populated by fabulous beings, at a time or some parts of the earth still offered good mystery. It was during the second half of the twentieth century that the two superpowers of the time, USA and USSR, engaged in clashes by countries and peoples interposed throughout the world, had the means, derived and financed initially by their armament industries, to measure themselves on a field of action to their measure, exciting and so new, from the race to space. It found itself invested - contrary to the progress made in the field of armaments - of a real popular craze. This quasi-experimental high-tech competition made its most media players, astronauts, heroes of modern times, and almost supermen, and benefited largely from this rivalry between the two great. To succeed was a matter of national pride and if history had not known a cold war, it is very likely that space exploration would have taken decades of delay. It is observed all the better that after the end of it, space exploration is slowing down sharply. Apart from the Mir space station and episodic flights from the American space shuttle, there is no longer a great human adventure. The presence of man in space is then limited to automatic exploration gear, the probes; and observation; but above all, with the development of IT and telecommunications, space becomes an industrial issue. Space agencies have become businesses, space must be above all profitable. The adventure is no longer appealing and the general public, concerned about the economic crisis and pollution, considers spending on this area as unhelpful. At the dawn of the third millennium, space is always dreaming, but it is well dream that is involved: The lack of credits released for space research largely hamper current programs. It is envisaged that the missions timid until 2020, carried out by an armada of probes, robots and other automatic vessels. The presence of man in space is done only through the international space station Alpha, whose crew conducts many experiments, research, and synthesis of industrial or medical products in zero gravity. The Moon: Second world colonized It can be considered that the daughter of the Earth nights should have received the presence of permanent bases some ten years after the first step of the man on his soil, in 1979. It was advocated at that time a permanent presence of the man and the first mining operations for the horizon 2000. the most serious prospectivists of NASA already envisaged to design the fixed modules which would be used for the installation of the first base before 1980 ... But it was nothing of it for various reasons. The main one was in the change of direction of American space policy. After this historic victory immortalized by the starry banner "floating" in the imaginary sea breeze of tranquility, NASA, but especially its leading cadres forced to follow the powerful financial groups that were behind these "prestige" scientific expenses, as well that the congress now anxious to spare the federal taxpayers portfolio, led them to consider space in a more "profitable" light. End the titanic adventure of space explorers riding their huge kerosene firecrackers, place to rational exploitation of satellite launchers, widely broadcast television, research for the earth. There was the Space Shuttle, a great solution to costly planetary extraction, and even Skylab, but more of a great adventure. Subsequently, the budget of Nasa melted like snow in the sun and a project as gigantic as that which presented Carl Sagan, namely the terraformation of the red star, remained a beautiful dream unattainable. Scientific research on the moon? It's a dead body, a desert of dust that does not fascinate the public ... -All the measures to be done were by the Apollo missions ... This old project, less defended, was almost passed in the oubliettes of the agency. The Soviets during this time were experimenting with large space stations, and their Cosmonauts were beating Saliut and then Mir with records of autonomy. The future was at the stations, and Alpha (ISS), reasonable and useful as part of an international partnership, was looming on the horizon. A permanent base in orbit. It could be evacuated in a few hours, against 24 hours for the Moon and two years for Mars ... and then we could build the first modules in space, the first ship to this red star that fascinated much more than the moon. De facto, the priority passed to the red star and the gray star played the role of appearing. However in 2055, the need to install a system for receiving / transmitting optical data to Mars (much faster than radio waves) led to the construction of a small base specifically designed for this, on its hidden side. Shortly after, a much larger telescope in terms of surface impressionable than the famous but aging Hubble was built a few tens of meters from this ideal site. Finally, ten years later, after a long tunnel dug three hundred meters deep, an immense warehouse locked up by a massive lead-airlock and surrounded by lead-chip plates, a storage of fissile material, was developed beneath the surface. cumbersome residues of the nuclear industry. Gradually, all land stocks were transferred to the moon. Faced with the need to produce modules directly in space, thanks to materials launched from the moon, a more distant solution but with the advantage of its low gravity, a small "mine" was installed in the most favorable sector, and an extraction station lined with a small refining and smelting site. An oblique launching ramp was set up nearby and heavy loads could be sent to the space at a steady pace. They were received by ISS beta. the Lunaire orbital station was responsible for placing these containers of refined materials and melted into compact booms in containers themselves placed along the "spine" of the second built freighter, the ITS-2 or "interplanetary transportation Ship". Very quickly, it was necessary to organize the construction of a giant greenhouse on the side exposed to the sun to feed the first Lunar colonists in resources. By 2100, the Moon had three permanent bases that housed some 82 astronauts, mainly mining and refining technicians. Subsequently, the discovery of other deposits naturally led to the construction of other bases. With the proliferation of mining sites and at the same time, juvenile towns, which remained for more than a month on the spot in rotating teams, the idea of ​​creating more pleasant and larger habitats using the Terrain configuration naturally led to the use of craters with high walls. Thus, the Sharonov crater, on the hidden face, responding perfectly to this definition, was requested for the giant structure (more than 18 km in diameter) which would be maintained above the walls of this crater concreted by huge masts duly harnessed to steel cables as impressive as those of the Golden Gate Bridge in its time. The cleared space thus frizzed 113 km 2 of surface. Enough to build hundreds of thousands of homes placed as wisely as possible in this space. Gravity not being absent, a fauna and a flora could grow under this bubble, because, once pressurized and inflated like a balloon, the structure flexible and transparent, a tarpaulin conceived by stacking small plastic sheets triply reinforced and sewn in carbon wire, welded by heating, was retained more than supported by the formidable thrust exerted by the artificial pressurization. In addition, the rigidity induced by the risk of microcracks was to be carefully monitored given the temperature differences to which this reflective surface was subjected (315 ° C. in total). Permanent security teams had the heavy responsibility of inspecting the tarpaulin 24 hours a day, as well as all structural parts. In case of weakening of it at any point whatsoever, it was planned to release pressure to relieve all, the time that the emergency teams do the necessary. The whole city below the crater had security equipment nearby locked by airlock, in case of alarm, the Lunar could take refuge in a few seconds. There were even plans for radar and advanced fire stations against all the risks of asteroid impacts, the other major concern of engineers. After the success of Sharonov, the most impressive, (it had been preceded by others, less extensive for fifteen years, including freundlich, 10 km in diameter), it was the turn of Coriolis and Shajn, two years of interval. The consortium that developed these systems then made a fortune in the "colonization" of many other dead bodies. The record in this matter was the one held by the Crater Lunaire Icarus, 21 km in diameter. By 3352, the Moon had reached its maximum level of development. Its population changed little thereafter, the activity that was practiced became more varied. The low gravity allowed the industry to make montages more dangerous than on land. The chemical and pharmaceutical industry also benefited. Finally, the sector-king, the iron and steel industry, derived from the exploitation of the mines, was still prosperous on this world whose surface abounded with metallic bodies. Space construction became one of the main activities of the planet. 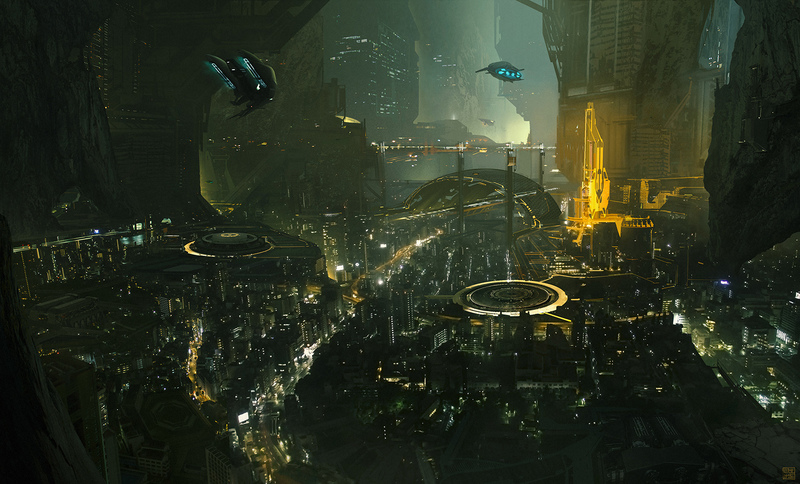 While there were 1.8 million lunar colonists, nearly half were involved in the arsenals business. Here again, the low gravity was doing wonders: Launching space in a space of 50,000 tons was a breeze thanks to some classic launchers. However most of the time the modules were sent by repulsion ramp, and the final assembly was in high orbit. The moon alone provided three quarters of the operational fleet of the land federation. Each year, it produced about two LNG carriers, eight long-haul freighters and twenty-two medium haul, as well as several hundred base and station modules, and small individual vessels. Most or nothing was built on Earth, the cost of launching remained uncompetitive, except for the supply of ISS 1 and 3 (Alpha and Gamma). Shuttles designed as small short-haul cargoes formed the majority of orders. A few centuries later, the Moon will be largely involved in interstellar conquest, building some of the largest settlements ever built. There will not really be any Lunar population, most residents turning with the land. But some could stay there for years and there was a very real minority of residents for life, for various reasons, including prison. A far greater and noble cause had for a long time definitely overshadowed the interest that could be brought to the star of the night.